Commencing the seemingly impossible feat of deciphering the films of Hungarian filmmaker Béla Tarr deserves a special kind of merit – and it is one that author András Bálint Kovács well deserves. 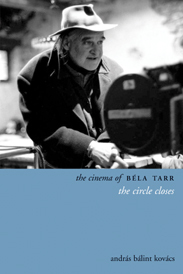 The Cinema of Béla Tarr: The Circle Closes is the latest publication written by Kovács, who is also Hungarian. The book is suited to Wallflower Press’ Directors Cuts series as it provides a relevant and up to date study of Tarr’s films. In 2008, Kovács wrote an extensive guide to modernist cinema, Screening Modernism: European Art Cinema, 1950-1980, which David Bordwell praised as being “original” and “comprehensive” in the blurb. Interestingly, The Circle Closes draws on many of the aspects discussed in Screening Modernism, providing windows of comparison between Tarr’s films and those of Antonioni, Godard and Bresson. However Kovács’ venture here is very much an intimate portrait of Béla Tarr as a person, a portrait that includes his loyal collaborators, and intricate examples of his unique practice across the entire filmmaking process. The Circle Closes begins with a touching list of acknowledgments – we get a sense of the friendship between Kovács and Tarr, who have known each other for over twenty years. It is refreshing to read a director’s profile written by one of his acquaintances, however unsurprising – Tarr has remained close to many of his collaborators. This is not just a book written by a film scholar on a director of interest, it is an account of the bond shared between Tarr and Kovács, and also Tarr’s wife and editor of his films, Ágnes Hranitzky. In the first chapter, Kovács examines Tarr on a personal level through his background, personality and early interests. He also pays attention to his collaborations, most notably his friendship with Mihály Víg, a composer known for his melancholic and often sinister soundtracks. Chapter two considers Tarr’s primal inclinations towards cinéma vérité and documentary narratives while the next chapter becomes more closely connected to art cinema examining the break away from realism. Next, Kovács moves on to discuss the formal elements in Tarr’s films through carefully structured graphs that indicate the variations between extended takes from Family Nest (1979) to The Turin Horse (2011). Additional emphasis is made on the “meteorological constants” (76) – images of rain, wind, mud – placed against desolate and abandoned environments. Chapter five examines such topics as banality or what Kovács refers to as an “everyday hell” (102), which leads on to questions of existence relating to the characters, the setting and the way in which Tarr places these two main features on screen. The final chapter presents an intricate breakdown of the characters and their calculated proceedings, which are in turn based on social status, personal traits and character dynamics. Fundamentally, Kovács pays due respect to a rich history of Hungarian cinema, from prominent auters such as Miklós Jancsó to a group of relatively unknown directors. Kovács eloquently contextualises other Hungarian filmmakers within the framework of underground Hungarian art movements of the 1970’s and 1980’s. Amongst them were the Orfeo and the Halász theatre groups, and ‘pseudo-art’ – a term coined by celebrated artist Gyula Pauer which Kovács explains as “…to create an artificial surface which pretends to hide something and at the same time reveals its own falsity, inasmuch as it shows that in fact it hides nothing” (40). What is often referred to as Tarr’s transitional film, Almanac of Fall (1984) is an apt example of ‘pseudo-art’. The performance of the actors is theatrical and the appearance of the set is stage-like, somewhat reminiscent of Derek Jarman’s work and in a more obvious sense, Lars Von Trier’s Dogville (2003). The book concludes with a statement of the impact Tarr has made on an international level as compared to his national status, which is close to unknown. Unfortunately, this is the case with many Eastern European cinemas where most of the population have been catching up on everything that communism prohibited them from obtaining, one of which is the fruits of Americanism – Hollywood cinema, Coca-Cola, blue Levis. The Circle Closes is the study of a Hungarian filmmaker written by a Hungarian professor of cinema. As readers, we trust the authority in Kovács’ voice and allow him to take us on a journey into the complex framework of Tarr’s oeuvre. Effectively, Kovács shows us Hungary – his country, his culture – via Tarr’s films, and as Westerners who have enjoyed the fruits for a long time, we are eager to experience the decrepit buildings and grey landscapes of a land once hidden from us.